How can I help a Veteran in need at Christmas? This is a common question for Operation Barnabas. We have the perfect opportunity for YOU to help 3 very worthy disabled Veterans this Christmas season. 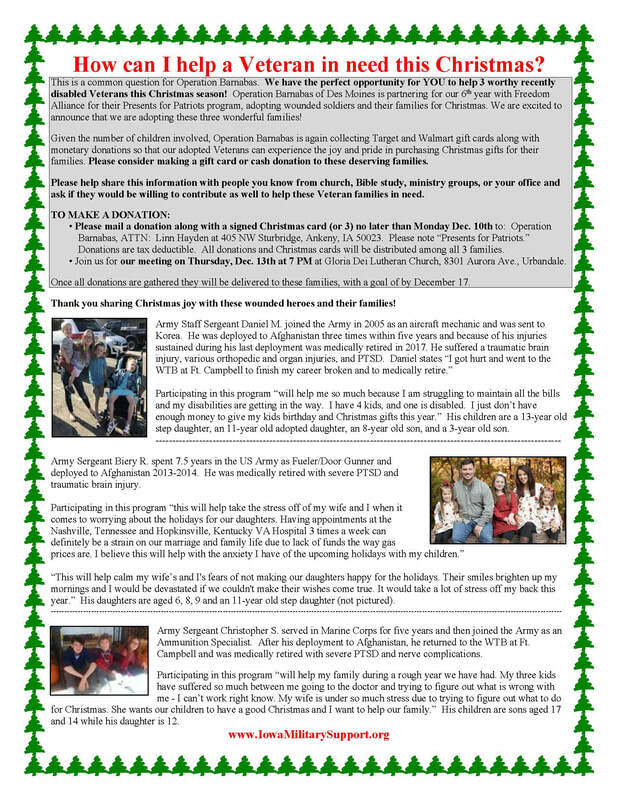 Operation Barnabas is again joining with Freedom Alliance for our annual Presents For Patriots program, adopting wounded soldiers and their families for Christmas. Operation Barnabas of Des Moines is dedicated to providing for everyday and spiritual support for military members, veterans, and their families in the greater Des Moines metro area and throughout Iowa. Our membership consists of individuals from several congregations in the Des Moines area. While Operation Barnabas is sponsored by the Lutheran Church Missouri Synod, ALL are welcome to join our efforts to support our military community. Operation Barnabas of Des Moines in an active group. Each year we host two Supply Drives - one on Memorial Day and another on Veterans Day to benefit the Des Mones Veterans Hospital and their outreach programs to veterans in need. Operation Barnabas of Des Moines also serves as a volunteer service to the Iowa National Guard's Family Support Services. You are welcome to join Operation Barnabas. All that is required is a strong sense of pride in our military. For more information please Contact Us.